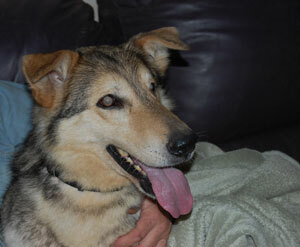 Joey is a very special Collie/Siberian mix thought to be approximately four years old who is completely blind. He was found lost and alone. We will never know his past history, however, we do know he is an absolutely wonderful dog that is affectionate and happy just to follow your voice and be part of the family. Joey is settling into his foster home and getting along well with the other dogs. He quickly learned his way around his foster home and the fenced backyard. He is an expert on getting on the couch and settling in for some cuddle time. On a sunny day, Joey loves to bask in the sun with his nose straight up sniffing the air, just loving life ~ Joey-style.